The rescinding of an invite to noted English language author Nayantara Sahgal to participate in the 92nd Akhil Bharatiya Marathi Sahitya Sammelan has triggered a strong backlash in the community of Marathi writers, poets and journalists in the state with over 30 of them deciding to boycott the event in Yavatmal. 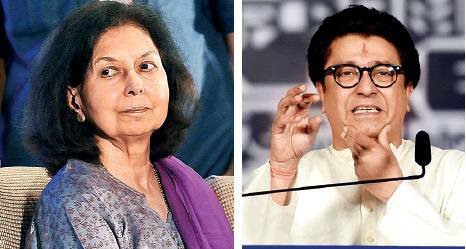 The censure came on a day MNS chief Raj Thackeray apologised as some local leaders of his party had objected to Sahgal’s participation at the conclave starting from January 11 as she is an English author. The organisers of the Akhil Bharatiya Marathi Sahitya Sammelan had withdrawn the invitation to Sahgal, who was in the forefront of the award wapsi campaign, after threats of disruption. Sahgal was supposed to deliver the inaugural speech and had even prepared it. Condemning the organisers’ decision, leading Marathi writer Asaram Lomate said that he would not attend the programme. “This is being done under pressure from mob. The Akhil Bharatiya Marathi Sahitya Mahamandal should instead take a strong stand and cancel the conclave. I will boycott the programme,” said Lomate, a member of Akhil Bharatiya Marathi Sahitya Mamandal. Another writer Balaji Sutar, who was supposed to participate in one of the talks at the conclave, has also decided to stay away. “It is an insult to all writers. The organisers should have known her views and writings. I feel it is an attempt to crush our voice. Also, bringing language politics in the literary meet is ridiculous. Earlier, Mahashweta Devi and Amitabh Bachhan have also attended the conclave,” he said. Namdev Koli, who was going to read his poem, added: “This literary conclave is known for creating controversies. I am not participating in it this time. But instead of hosting such a big literary meet and create controversy, there should be small, meaningful events,” he said. Noted writer and journalist Jayant Pawar and 27 others have issued a statement, protesting against the cancellation of Sahgal’s invitation. “Withdrawing the invitation to Nayantara Sahgal is beyond condemnation. A blame game is on as to who did it. But we are not interested. As Sahgal in not attending the event, the organisers should not have much problem. But we want her speech should be read in the event. Our second request is to the Chief Minister. The atmosphere is not so free for writers. A few are even given police protection. But the chief minister who is also the home minister should declare in the event from whom the writers, poets have the threat,” the statement said. The strong reactions prompted Raj Thackeray to issue a clarification. Chief Minister Devendra Fadnavis also could not steer clear of the controversy. “The government has no role in inviting anyone for the event. It is the organisers who decide. There is a deliberate attempt by the media to drag the government into the controversy,” said Fadnavis, who is set to attend the inaugural session. Guardian minister of Yavatmal Madan Yerawar, who is hosting the event, said that he was not in the know of the invitations. “It is the organisers’ responsibility to extend invitations. I have nothing to do with it. I am the default host, being the guardian minister of the district,” he said. The executive president of the 92nd Akhil Bharatiya Marathi Sahitya Sammelan Dr Ramakant Kolte and president of Akhil Bharatiya Marathi Sahitya Mahamandal Dr Shripad Joshi didn’t comment on the issue. The proposed president of the conclave, Aruna Dhere, also wasn’t available for comments. Nayantara Sahgal, who was to inaugurate the Marathi literary conference in Yavatmal district on January 11 in the presence of CM Devendra Fadnavis, claimed in her inaugural address that basic freedoms had been imperilled. “All our freedoms are in danger… This has affected everything we do: What we eat, whom we marry, what we think, what we write, and how we pray. Anything that asserts diversity and goes against the thinking of the ruling establishment is under attack,” she stated. The Maharashtra government provides a grant for the literary meet. Sahgal’s address said the Constituent Assembly, made up largely of Hindus, had decided India could only be a secular, democratic republic. However, “today a move to confine us into a single religious and cultural identity is threatening this diversity. It seeks to divest crores who are not Hindus of their constitutional rights and cast them as invaders, outsiders and enemies,” she alleged. “Bigots who roam free on streets are targeting minorities and anyone who does not support their vision of turning India into a Hindu rashtra,” she added. In a reference to the arrest of alleged Naxalites by the government of Fadnavis who was to share the dais with her, Sahgal said five citizens had been arrested under charges of sedition and conspiracy. “These are citizens who have given their lives to securing justice for tribals, forest dwellers,” she said. She alleged mobs were attacking and even killing Muslims by spreading rumours about cow slaughter. “Such attacks are going on in Uttar Pradesh and the government machinery is watching. In some cases, offences have been registered against victims while perpetrators have been felicitated,” she noted. She compared the current atmosphere in India to that in Russia under Stalin and said rationalists had been killed. She alleged there was an attempt to wipe out references to Mughals and to Nehru and scientific inquiry was being replaced by mythology. “The autonomy of institutions is being eroded. The Nehru Memorial Library and targeting of JNU are examples of this. I cannot accept this brand of Hindutva,” she said.